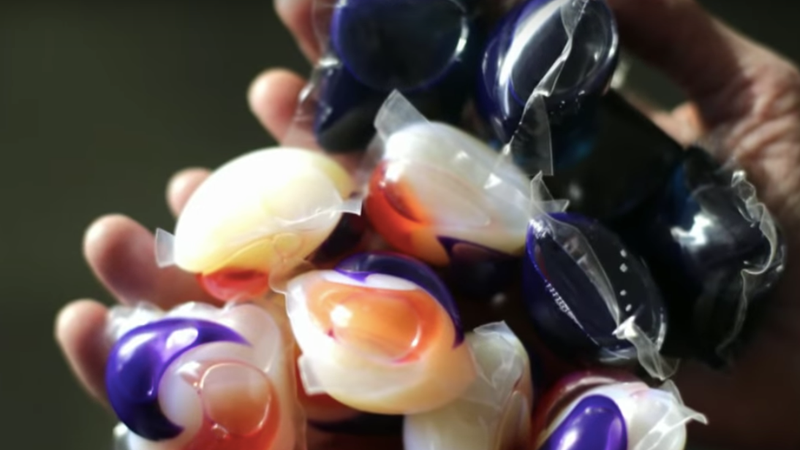 Although Tide Pods have been around since 2012, the recent idiotic “Tide Pod Challenge,” in which (usually young) people dare each other to eat a pod of laundry detergent, has now led to a public health concern, with network news outlets calling the “craze” “dangerous, potentially deadly” (inspiring a funny Onion headline, at least). This led to some people actually smoking them, or cheekily suggesting Tide Pods as a new Oreo flavor. Now a New York pizzeria has created “Pied Pods,” little stuffed pizza squares with strips of blue and orange toppings that resemble laundry detergent packets. On Instagram, Vinnie’s Pizzeria claims to be “concerned about the youths,” and so created Pied Pods pizza with the bright colors that the “youths crave,” by dyeing mozzarella cheese in Tide shades of blue and orange. While the pizzeria’s claim that its detergent-resembling pizza is an attempt to create a “gateway food for kids to get back into actual food,” creating food that looks like something that shouldn’t be eaten anyway seems like the worst way to go about doing that. Actually this just looks like a publicity ploy for Vinnie’s Pizzeria in Brooklyn—so, mission accomplished. In conclusion, can’t even believe this needs to be said, but: Please don’t eat Tide Pods. Thank you.